Our sip of summer pineapple blonde ale is back, so we'll be partying all day. Starting at noon we're tapping the first keg, opening sales of sixers, and getting the party going. Mad Moxie Hospitality will be with us from 5-9 PM with summer-inspired deliciousness designed to pair perfectly with Greenwood Beach. Summer day party vibes start at noon and go all day. “Brume” is a word derived from Old Occitan that describes an encompassing mist or fog, which is what the hazy IPA style seems to have become these days. The Brume transforms our landscape, obscuring what was clear, confusing what was known, and making the familiar strange. Brewed as a collaboration with the talented brewers of Illuminated Brew Works, the Brume is our first foray into this strange, foggy realm. With its softer edges, tropical notes, and refreshing finish, this double dry hopped IPA challenges long-held beliefs and captures the imagination. The Prairie Moon Pop-Up will be in effect for the release, so your belly will be happy all-around. Best enjoyed fresh, we recommend drinking The Brume as soon as you can and discover the deliciousness that lurks within. This unique event features Temperance beer pairings with Mad Moxie’s NOLA-themed recipes, using AWE-SAUCE! 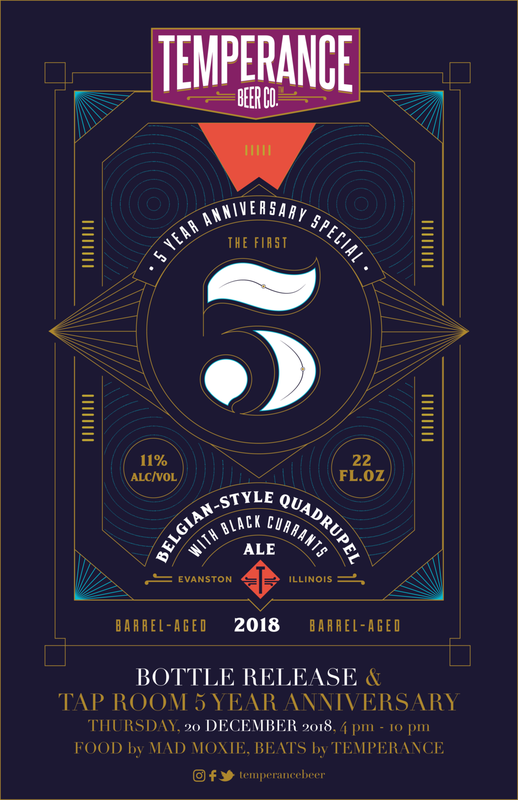 To toast our first five years, we came up with something special: we took Today is the Day, our Belgian-Style Quadrupel, aged for a year in whiskey, rum, and port barrels, and added ripe black currants before bottling. The result is a gorgeous beer, garnet in color, with aromas of chocolate cherry cordials, and a luxuriously long finish of tart raspberries, vanilla, and port — most certainly a beer for celebrations. We are releasing this 5th anniversary beer on the 5th anniversary of the day our Tap Room opened, so please come raise a glass with us on December 20 to celebrate the first five and muse upon what the next five may bring! Mad Moxie will pop up in the Tap Room with delicious bites from 5-9 PM! Plus, we’ll tap a special keg or two…. This beer will only be available in the Tap Room. Bottles go on sale at 4 PM. Limit 6 bottles per customer. Join us at Fred’s Garage in your ugliest, funkiest best for a chance to win fabulous prizes while sipping on some Temperance beer specials! Special Thanksgiving Day version! Book here! Come celebrate Temperance’s launch in Cincinnati this weekend with 4 hours of reggae! Temperance is expanding to Cincinnati! Come celebrate with us Friday evening at Mac’s on the Pike! Temperance is coming to Cincinnati, OH! First up, the Growler Stop! YES! Our Halloween party is back! Unleash your inner artist with some paints and a pint (or a few, no judgment here)! $1 off pints, a free brewery tour, and 10% off of merchandise! Celebrate FIVE YEARS of Evanston beer September 14! Join us on Friday, August 17 to experience Birdsong in cans for the first time! We can’t wait for Slick Rick w/ The Cool Kids to finish off an incredible summer concert lineup at Temperance! The Lone Bellow and Skyway Man visit Temperance for Out of Space Weekend 2! Join us for the SOLD OUT Dinosaur Jr. event to kick off the second weekend of Out of Space! Our monthly brewery tour continues through July! Join us for a behind-the-scene look at the brewery, many beer samples, and discounts on merch! Rebirth Brass Band plays Temperance June 23 as part of our Out of Space series with Evanston SPACE! Join us for a feast! All-you-can-eat crawfish, corn and potatoes and live music from Big Shoulders Brass Band! **Does not include admission to the Rebirth Brass Band show. Join us for the second Out of Space event at Temperance! The sold-out New Pornographers show with Split Single, June 22! Out of Space kicks off with Shovels & Rope w/ Becca Mancari, June 21!